Part Patrol, part Altima, the newest Australian racing car is taking shape. Nissan has confirmed its new V8 Supercar will use the 5.6-litre V8 engine from the upcoming new Patrol four-wheel-drive. However the engine will be reduced in capacity to 5.0 litres - matching that of the Fords and Holdens it will line up alongside on the grid - and be heavily modified for race use. The car will also use some panels from the mid-sized Altima to be unveiled this week at the 2012 New York motor show, a car that will go on sale here later in 2013. Kelly Racing - which currently races four Holden Commodores and will next year be renamed Nissan Motorsport - is busy sending the car's dimensions and images back to its Melbourne headquarters so it can continue development of the new car, which will conform to V8 Supercar Car of the Future regulations that apply from 2013. 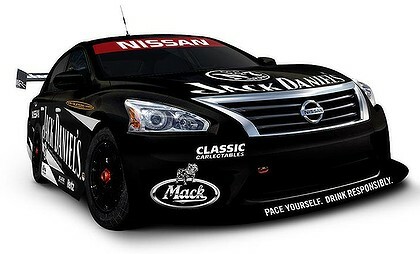 It is in the process of building "between 16 and 18 all new Nissan engines" to comply with the V8 Supercar regulations. The car will then be tested against the rival Fords and Holdens to ensure performance parity - to make sure it is no faster or slower and there are no advantages due to the construction of the car. And the pressure is on to rush the new car to the track to ensure it's up to pace by the first race of the 2013 season in February. Nissan has set performance targets for the team and expects podium results from the start. "Our expectations as a manufacturer is that we expect to be competitive from day one," says Ian Moreillon, Nissan Australia's executive general manager, national sales and fleet. "Do we expect to be on the podium in 2013? Yes. Do we expect to win a race? Love to. We do expect to be competitive and we expect to be on the podium next year on more than one occasion." Kelly Racing team CEO John Crennan - the former chief of HSV and the Holden Racing Team - says it is a race against the clock to bring the new car up to speed. "The guys are going to need every minute of this year to be able to do all the design work, build six cars, build a heap of engines, etc [to make the car competitive]," he says. Nissan has also been relying on the cooperation of its international operations - Australia is the first place the Altima will be raced - in helping pull the project together. Only this week a selection of the new car's panels were air freighted to Australia to be fitted to the race car. "To get those panels ... we interrupted the North American production process," says Jeff Fisher, Nissan Australia senior manager, corporate communications. "They turned off North American production for us ... just to make our pre-production panels." Driver Rick Kelly says the team will forgo pace this year to focus on ensuring its historic 2013 assault - the first time a non-Ford or Holden has taken to the V8 Supercar series - is successful, although he admits getting the car to a vital test session in August will be a challenge. "We've built all of our resources around the success of this year rather than next year," says Kelly. The Kelly team - whose lead drivers are Rick and his brother Todd - has employed six international engineers to join the broader team in shaping the new car. Already the team has built the roll cage, and parts were this week flown to its headquarters to begin draping them over the new shell. The team began investigating the 5.6-litre V8 last year, telling anyone who asked that it was a side project to power the brothers' speed boat. The new $20 million facilities in Braeside in Melbourne's south-east have been visited by senior global Nissan executives. It will be rebranded as Nissan Motorsport, include a showroom and a café likely to be named after the Altima model. Crennan says he is hoping to turn the impressive new facilities into a tourist destination. "The car will then be tested against the rival Fords and Holdens to ensure performance parity - to make sure it is no faster or slower and there are no advantages due to the construction of the car." I don't have a problem with them all being limited to a 5ltr NA V8, or similar... but if one v8 is better, so be it. it depends. The current control 5.0litre is pretty inherant between the fords and holdens. so if the nissan is better, which it more than likely will be, it will be better than both. current trends in v8 supercars lean more to driver wins than make/model wins, because of the mechanical similarities. the question will be will the new nissan be a modified nissan to simulate a holden/ford 5.0 or will it truly be out on it's own? And what happened to toyota? fail? the question will be will the new nissan be a modified nissan to simulate a holden/ford 5.0 or will it truly be out on it's own? first line says its a nissan engine. and yea toyota pulled the pin i believe. Nissan has been producing V8's in SUV's for more than 20 years for the US Market, as far as i remember they were all OHC's, im hoping that now BMW may be entering the race that Ford can use its Coyote DOHC engine which means Holden will bring out its new 5.5 litre OHC & that we will be able to see all these Multi valve engines aginst each other, im keen to see which one will s**t itself first! In theory its great if one manufacturer makes a better car or motor than another, but control measueres are important and are alot like the salery cap in footy. You have to make it fair for all competitors otherwise the sport is dominated by a team or make just like Skaifs Godzilla and it makes it pretty boring. Agreed, but if one team developes something in the engine that gives them an advantage it will soon filter through the rest of the teams. Some control measures, but not so that everyone is essentially in the same car. Pretty sure they both run the same basic 'blueprint' 5.0 block ford and holden at the moment. Hence no 5.7s or 5.4s, which is a shame. It should go back to heavily modified basic production cars. if it was unlimited to power and engine size it would get redicilious. the idea of motorsport racing is to see which teams can get the best set up on the car over someone else with the same (or slightly simular) engine, which shows they are a better team. comes down the the expirence of the crew, driver and the set up of the car. IMO the series would be a load of s**t if there was no restrictions on the regulations. it has to be fair to show skill. i wouldnt feel big doing lap times around a track in my falcon compared to my grannys 121 lol..
just my opinion. everyone has their own. ED Fairmont Ghia. t5 conversion w h/d exedy, 3:45:1 lsd, pacemaker extractors, 2.5" custom exhaust, waggott cam,K&N high flow panel filter, TI performance chip w/ 4 tune switch(2 ED, 2 EL tunes) king 18's, el thermo fan w/ Davis Craig switch. 5000K hids,led lighting, doof box in boot.